• 49ers coach Jim Harbaugh may be getting a fine, because he was was wearing a Reebok pullover in the first half of yesterday’s Niners/Packers game. He did switch to a Nike model for the second half, however, so maybe someone from the NFL leaned on him. 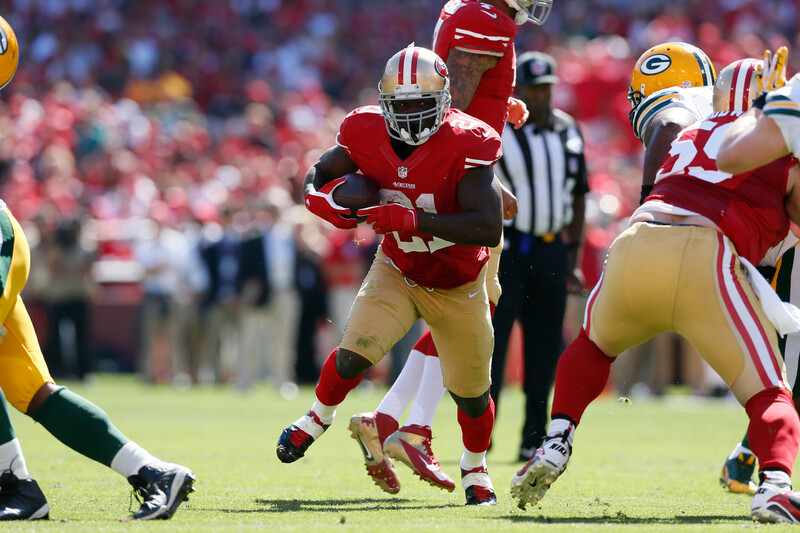 • Speaking of the Niners, sure looks to me like Frank Gore wasn’t wearing any knee pads. So much for all the “Wear the pads or we’ll keep you off the field” bluster. • From that same game, some of the Packers — but not all of them — had seriously wide pants striping. An odd inconsistency. • Moon over Kansas City! That’s Chiefs defensive end Tyson Jackson suffering an unfortunate wardrobe malfunction during yesterday’s game against the Jags. • I believe this was our first on-field look at the Vikings’ white-over-purple format, and I think it looked pretty good — well, except for the leotard effect. Get them some striped white socks! • Some very classy Buffalo fans showed up for the Bills/Pats game wearing Aaron Hernandez prison uniforms. 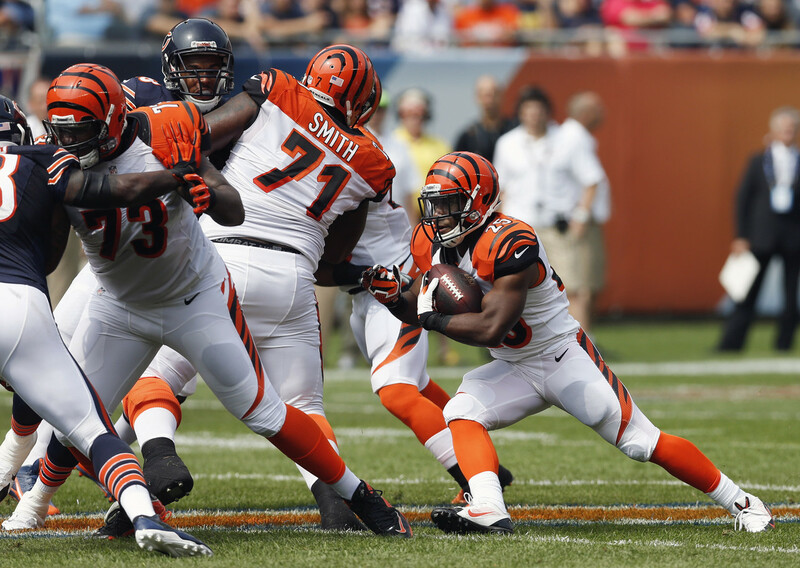 • When the Bengals wear white jerseys and white pants, they usually go with black-topped socks. Yesterday, however, they wore orange-topped socks. • “Beloved” watch: During the Niners/Packers game, Joe Buck referred to Steve Young as “beloved.” I’m tellin’ ya, people, this thing is spinning out of control. Zero “beloved” tolerance! • Arkansas State was penalized 15 yards for wearing insufficiently contrasting uniforms. They should’ve been given another 15 yards for the unis being so ugly. 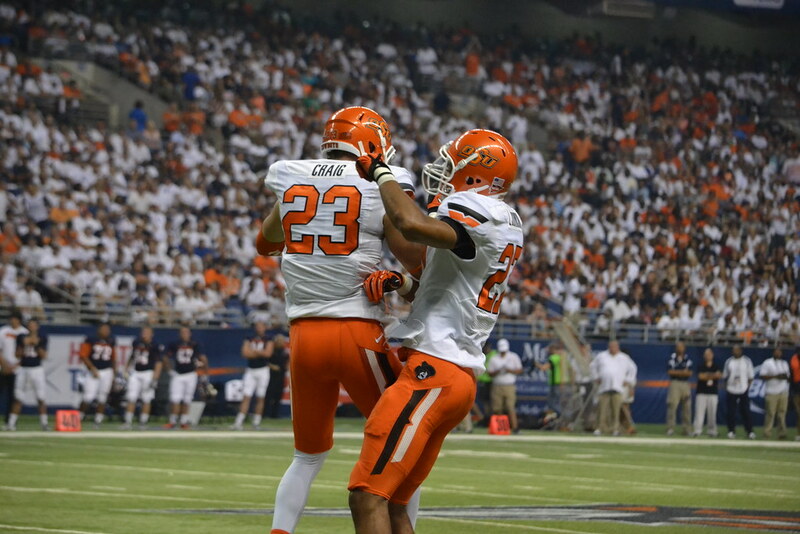 • Was this the first time Okalahoma State wore orange-white-orange? • San Jose State and Stanford went color-vs.-color. • Just what the world needs: logo creep from an undershirt that’s visible through a dress shirt. That’s Miami Head Coach Al Golden being interviewed after the ’Canes upset Florida. 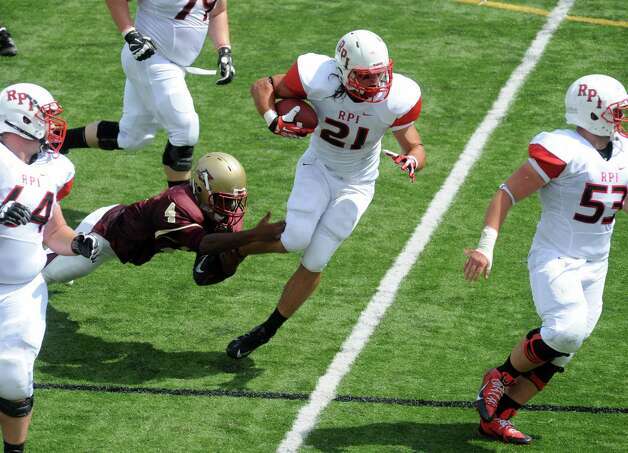 • Elon University wore flag-desecration helmets on Saturday. The flag abuse extended to the midfield logo. 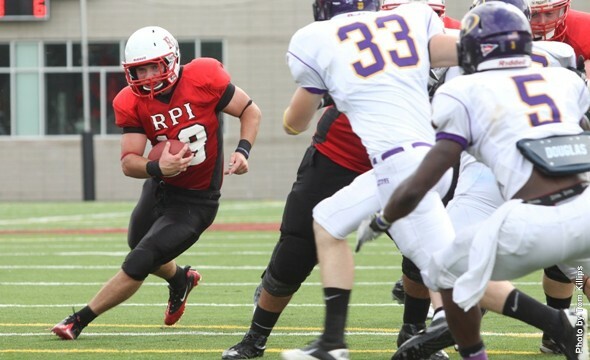 • RPI, which usually wears red jerseys and black pants at home, went with a whiteout look on Saturday. ’Skins Watch: It had previously been reported that Peter King’s new SI website wouldn’t be referring to the ’Skins by name. Now it turns out that other writers on the site will be free to use the name or not, as they see fit, but King himself won’t be using it. He explained why, in a very reasonable tone of voice that I think even those who disagree with him will be able to respect, in his column last Friday (you have to scroll down a little bit to get to the relevant section). Meanwhile, that same day, Bill Simmons avoided using the ’Skins name in his Friday column, instead referring to them as the Washington D.C.’s (scroll down to No. 17). Turns out Simmons had already mentioned this, if only in passing, on his podcast last Tuesday (skip ahead to the 51:45 mark). More and more sportswriters around America will refuse to use the Redskins nickname as the season progresses now that King and Simmons are on board. What happens when other ESPN, or SI, or Fox personalities make the same decision? What happens when a SportsCenter anchor refuses to say “Redskins” during an NFL highlight? It’s inevitable. … As “Redskins” gradually disappears from the mainstream sporting culture, sooner or later the nickname won’t be worth the negativity attached to it. As if to reinforce Yoder’s point, I’m told that Max Kellerman, host of ESPN2’s SportsNation, announced on Friday that he too won’t be using the ’Skins name, although I haven’t been able to confirm that. Kellerman obviously doesn’t have as much clout as King or Simmons, but his move, assuming he actually made it, is another push toward the tipping point on this issue. This is the part where I’d normally say, “Slowly but surely, people.” Not gonna say it today, though, because this thing isn’t moving so slowly anymore. ”¦but I know what I like: I don’t often talk about art — like, visual art that hangs in museums and galleries and such — but on Friday evening the New Girl and I attended a Manhattan gallery show that I think Uni Watch readers might like. I’d heard about Wagner before (the New Girl used to date him a long time ago, and he once made a life-sized currency portrait of her), but I’d never seen his work in person. Having now seen it, and having also read a bit of his writing about his art, I think it’s fair to say that he’s a genius, or whatever term you care to use for someone who can run rings around your head until your mind is blown. Count me as a big fan. You can see Wagner’s and Poppie’s work (along with some work by a third artist whose stuff didn’t wow me) from now through Oct. 5 at the Pavel Zoubok Gallery in Chelsea. Highly recommended. Thanks, buddy: Many of the Ticker items you’re about to see were compiled by Phil. Big thanks to him for dealing with that while I was away for the weekend. NFL News: The Pats appear to be using very inconsistent spacing for their helmet numbers, apparently depending on the type of helmet (from Mike McBride). ”¦ Nathan White saw a commercial — not sure what for — that shows Wes Welker in a current Broncos jersey while one of last year’s jerseys, complete with the neck roll, hangs in the locker behind him. ”¦ Popular Mechanics ran a good piece on the evolution of pro football helmets (from Jeff Proctor). ”¦ Brian Jud notes that one of the current “Superstition” ads that the NFL is running features Rams fans in the team’s old retro colors. Given that the Rams have a redesign in the works, could this provide a hint regarding what’s in store? 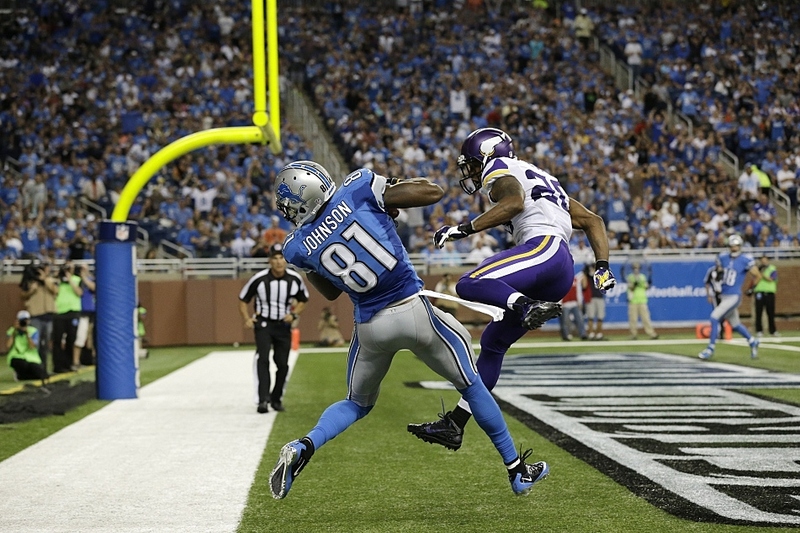 … Is Calvin Johnson wearing JrOB this season? They’re selling his jersey that way. Jared Patz recently spotted that at a shop in Traverse City, Michigan. College Football News: Check it out: team-colored tortilla chips. Can’t wait to see the BFBS versions (from Brice Wallace. ”¦ Two Ohio State players have switched uni numbers (from Tyler Nees). ”¦ USC fans are taking some creative liberties with the “Fire Lane” signage around the L.A. Coliseum (rare non-Notre Dame contribution from Warren Junium). … Tyler Maun points out something interesting about the four QBs on the Nebraska roster: Their names are Taylor Martinez, Tommy Armstrong, Jr., Ron Kellogg III, and Johnny Stanton IV. “Just bizarre that not only would there be three of four QBs with generational suffixes in their names but that they go in order from Jr. to IV,” he says. Hockey News: Very nice old-school uniforms for the St. Louis Jr. Blues (from Joe Mueller). ”¦ Ken Pilpel is the commissioner of a pee-wee hockey league that uses three-digit uni numbers. “Seeing a three-digit number on an 11-year-old is interesting,” he says. Bengals were wearing orange socks with the white pants/jerseys yesterday, if I recall they usually wore black socks with that set. Good one! I’ll add that to the main text. RE: Wes Welker commerical. It wasn’t just one uniform with the neckroll behind him. It was all of them. Really strange considering they would go to the effort to have him in a legit jersey. Welker commercial was for Old Spice deodorant IIRC. Those collages are cool, but arent you not supposed to destroy/mangle/… u.s. currency? Also, picts going around of a black/gold third sweater for canadian hockey team. Pretty sure that’s an urban myth (I heard the same thing when I folded a penny in a vise in eighth grade shop class). And even if it’s true, what would be the purpose of such a law? If I want to destroy my own wealth, why can’t I? It would be like a law against punching yourself. But (and maybe I’m totally wrong here), isn’t the amount of money in circulation supposed to be a certain value overall to the US gov’t. I know actual value of money depends on whatever voodoo they work now, but I would imagine they have money in circulation to correspond to the value of American money that “they” deem should be in existence. By destroying those pennies and dollars (on a large scale), one could be skewing the value of American currency. Rarely if ever enforced, though the Secret Serrvice did inform the “Where’s George?” folks some years back that their thing of stamping their website onto bills was a crime. Stick to $1 bills and you’re probably fine – the government cares so little about ones that it hasn’t bothered to add any of the anti-counterfeiting measures incorporated into the other bills since 1996. Oh, and another thanks for sharing. I’d never heard of his art before, but that’s fantastic. His choice of medium adds so much depth of meaning that it makes his work like something out of a Borges story, or an Eco essay. Reminds me of the segment NPR’s On the Media did a couple of months ago about the FBI anti-piracy warning on DVDs. Same idea – yes, it’s on the books, but the authorities aren’t going after the average movie viewer sitting at home, just like the attorney general isn’t going after an artist who’s not out to manipulate currency and destabilize the global economy. But any prosecutor could go after him for it, or after many of us for trivial offenses we all commit from time to time. Obviously the Secret Service is unlikely to go after the artist on the grounds of defending the currency. But say he creates a political poster that angers someone in power – his clear and repeated violation of this actual federal law could be used against him by an overly zealous, politically motivated prosecutor. This is exactly the sort of thing that the Nixon White House pushed the Justice Department to use against its political opponents, and that J. Edgar Hoover’s FBI regularly used against innocent Americans for decades. That’s why trivial and rarely enforced laws are bad for the rule of law. Better to repeal the law than to leave it on the books, unenforced. Which argument I would also apply to about one-third of the rules of football. This generally topic got me doing a quick online search on ‘currency art’. Along the way found this short article dealing with the legalities of using coins as art. The fact is with his type of art, every time he makes a new piece, he is ‘cutting’ into his profits. Oh stop your groaning, that was a great pun. No, Mark does not use pre-shredded bills. He cuts fresh bills himself. Fresh cut currency is the best. Once you’ve experienced the artisanal US currency art, you can’t go back to the mass-produced, pre-cut kind. BTW, ever try scanning US currency with your scanner? That’s too bad. Because today’s copiers are designed to prevent you from printing counterfeit bills. Same goes for scanners. The printing may have appeared perfect to the naked eye, but no one who handles currency regularly would have been fooled. The texture of the ink and of the paper is the single most important anti-counterfeiting element of our bills. Which is why many counterfeiters convert $1 bills into $20s or $100s – you can fake almost everything about an American bill, but you can’t fake the paper. Funny thing is…this “paper” currency isn’t even paper! I was wondering that, too. I didn’t think it was legal to destroy $$. PS, what/where’s this “Chelsea” Paul mentions? The Al Golden logo creep – I’m really shocked at this point he hasn’t been given a button-down shirt with the Nike logo already embroidered on. He’s been doing the shirt and tie on the sideline for years now. I’m surprised Nike doesn’t make a line of “performance” dress shirts for coaches. I mean, Reebok made a suit for Mike Nolan. I really like Poopie’s art. Looks like it belongs in the MOMA. This article says its illegal, but $100 fine. I always thought collectible currency (state quarters, …) was weird, since you had people willingly tsking money out of cvirculation, even its only $12.50 a person. The Treasury *wants* you to take money out of circulation, because they make a profit on the money they sell to the Federal Reserve. That’s why they make so many collectible items. I really like the smiling cartoon hockey puck icon next to “Hockey News”… Great job on the ticker redux/redesign! Not having an NHL team in town as a kid, I’d never gotten to see Peter Puck till the new Ticker format debuted. He looks like a tuna roll on skates! The Patriots spacing seems to be dictated by the helmets themselves, blots, raised line etc in the way. Um, yes, that’s what I wrote. It’s illegal to deface currency. The degree to which everyone is eager to rush in with this rather weak “Gotcha” point (see above) is fascinating. Also disappointing. Is this really your only reaction to the art? Just a thought…. perhaps the “money” is worth MORE now since it has been “artified”. ???? Oh, it’s worth a LOT more. There’s a long tradition of commingling money and art to explore the concept of value. The artist most famous for this is J.S.G. Boggs, who makes “bills” or “notes” that look a lot like real currency, but with several small but obvious differences, and then tries to spend them. He never claims that his notes are real currency — he always says they’re his art. He usually says something along the lines of, “What you call ‘real money’ is ink on paper, and you choose to believe it has value. My art is also ink on paper, and it too has value. Why not let me spend it?” He’s been prosecuted for counterfeiting many times, in several different countries, but has never been convicted. There’s also a documentary about him, called Money Man. Book and movie both highly recommended. I guess we oughta do away then with the U.S Attorney’s Office. Yes, when that’s your only reaction to art. One of art’s functions is to be transgressive, to stretch boundaries, to make people think. If the sum total of one’s reaction to Wagner’s art is to cite a never-enforced rule, that’s weak. How about thinking about WHY that rule exists in the first place? Why is it never enforced? What are the implications and ironies of an artist who’s been “violating” this never-enforced rule for many years? Simply stating “that’s illegal” and then closing up shop is a lazy, insecure way of trying to diminish or even negate the art. Like, “No need to discuss anything here — I learned back in third grade that that’s illegal, so everything else is moot.” Yes, that’s weak. As for the U.S. Attorney’s office, perhaps you should call them and ask why they haven’t prosecuted Mark Wagner, a career criminal whose crimes are available for all to see at a Manhattan gallery. I hear you Paul, but art that claims to be “transgressive” is only transgressive if it provokes awareness of the boundary crossed. So if it’s valid to say, “This art is supposed to be transgressive,” then people immediately observing, “That’s against the law” is both an intended and necessary reaction. Not something that justifies shouting “Philistines!” back at those who make the observation. Personally, given the triviality of the law in question, I don’t care whether it’s nominally illegal, but the triviality of the nominal offense also means that the art is minimally transgressive of formal law. The boundaries it really does transgress are much more interesting than the merely legal! art that claims to be “transgressive” is only transgressive if it provokes awareness of the boundary crossed. So if it’s valid to say, “This art is supposed to be transgressive,” then people immediately observing, “That’s against the law” is both an intended and necessary reaction. But that only holds if you then explore, at least minimally, what the transgression means and what its implications might be. Simply saying, “That’s illegal” as the sum total of one’s reaction, without digging any deeper, is no reaction at all. It’s not thought; it’s a refusal to think. To me it seems we are increasingly turning into a “Gotcha” society. Especially since the arrival of the internet, smart phones, and any other avenue that one can easily look up obscure, largely ignored and meaningless, but technically correct information. In today’s day and age, when someone does something cool, different, thought provoking, etc. Someone is quick to be there to point out some obscure or unimportant piece of information to try and take away from the overall impact or importance of what was created or done. I agree with Paul. Why do these people feel the need to have this as their first reaction? Why can’t they just accept the art for what it is and not try to diminish it by citing some unenforced law. Just give something like this its just dues and don’t try to one-up the artist with this drivel. Why do they feel the need to bring it up. Attention? To look smart/clever? Jealousy? Adding to Mike V’s great reactions, one of my first responses was, “Is that really a Lincoln portrait composed entirely of ones, not fives?” Seeing that it is was one of those mind=blown moments that great art can provide. To me, that’s transgressive in several deep ways that more overtly political or rule-breaking art rarely achieves. And his website (http://markwagnerinc.com/) lets you donate to help him buy crisp new bills for his work. I’m in for $5 in honor of that Lincoln portrait. And his website (http://markwagnerinc…) lets you donate to help him buy crisp new bills for his work. At the gallery, the catalog for this show was available for $5. A little sign said, “Crisp bills preferred.” I bought the catalog, but I only had old, fairly worn-out bills. It took me a while before I realized that the “bristles” were not arranged randomly. They form an extended image of a complete dollar bill! My goodness, that broom is wonderful. Love this story, and of course, the art. Thanks for bringing the artists to my attention, Paul! 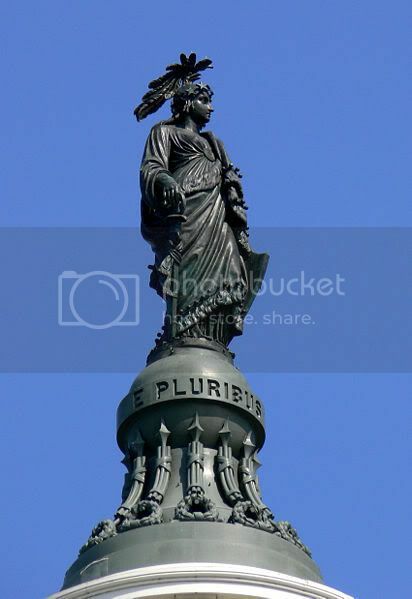 The Abe Lincoln is just cool on all sorts of levels. Well, I find it to be really fascinating as art. Adds a lot of class to Uniwatch too, amidst all this football talk. Can art not just be, y’know, art? Why all the fuss over a law that will neither affect 99.9% of us nor will we ever be charged for simply appreciating the creation? It’s art. Appreciate the artistry. Stop looking for flaws. Playing “gotcha” with the currency rules is at least a refreshing change from playing “gotcha” with the Flag Code. Thanks for presenting some of his art. I enjoyed it BUT it also left me frustrated because looking at the images on a screen you just know how much better it is in person and how much you’re missing out on by not being there. I like Wagner’s art plus it makes for interesting conversation in regard to defacement. If taggers are caught, they’re made to make retribution monetarily, by removal of the offending artwork or both. Wagner creates art by mutilating federal property. Similar circumstances, no? Or is it just small potatoes when compared to the massive amount of graffiti? If you can’t be ’em, PANTS ’em!! Yep, this might be an influential development. Each of those guys has tons and tons of readers. Simmons more than King, I would hazard, but King’s demographic probably skews older and more conservative (socially and politically), and hence his decision may stir up a more enraged bees nest. Which is good. I like and read Simmons, though rarely to the end of his columns and podcasts. [The dude is industrious!] I find Grantland to be a very handy place for a codger interested in young writers and young writers’ takes on pop culture(s). And I appreciate and enjoy the way Simmons provides a podium to so many African American writers and critics and — even — current athletes and ex-athletes. Jalen Rose has risen high on my list of must-check-in-with. For better or worse, Simmons probably started sports blogging as we know it. And yeah, Grantland has exceeded my expectations. Whatever you think of him, he has a great taste level and eye for talent. That’s been my reaction; I don’t care for Simmons himself, but I find a lot to like in Grantland. Peter King has systematically run off his conservative audience with lots of politicking on predictable left issues. His audience is the “mainstream media” audience. His audience is the “mainstream media” audience. In any case: Peter King has over one million Twitter followers and has just been given his own subsite by Sports Illustrated. I think it’s safe to say he hasn’t “run off” too much of his audience. Or if he has, a big part of his audience still remains. Was simply meaning to contest Mr. N’s statement about the conservatism of King’s audience. It’s clearly a big audience, it just isn’t well characterized as conservative. This “guest” came across exactly zero articles written about the Boston or Washington Redskins that portrayed the team/individual players in a positive manner from the time period mentioned even though the Washinton Redskins were NFL champs in ’37 and the Boston Redskins played for the title in ’36? Don’t have a picture, but the Lions added a smaller DETROIT in black next to the word LIONS in the end zone, in the same typeface. Speaking of money……. Anybody ever come across a “Where’s George Been” bill? I have. Pretty interesting. A really good application of the info from “Where’s George” is this map which redraws US state borders based on how money moves. It’s interesting to see which regions, natural borders “work” and which don’t. Haven’t come across a “Where’s George Been” bill because I rarely see U.S. currency, but have come across a few of the Canadian version – the “Where’s Willy” ones. Also have seen one of the Spock fives. Ran across one of those last week while in a bar near the new WTC….my pals from England were really intrigued and will be tracking the bill they received. Quick google search seems to say destroying or defacing money is illegal, but the penalty isn’t severe and is unlikely to be pursued in what would punt to a free speech case. Also, o e could argue that the value of the money is included in the sale price of the piece, so really the money isn’t out of circulation any more than money under your mattress is out of circulation. But like many here, I’m speculating. oh wait, that’s been covered. The Lions endzone looked a lot like this logo (not sure if it was exactly the same, but this is very close to what I remember seeing yesterday). It can be seen in these highlights. Yep that’s what it looked like. Can kinda see it here. And it’s easy to see in this gif. Ford Field replaced all of their Field Turf for the first time since the stadium opened in 2002, thus needing to repaint and changing the look. Between Thanksgiving game logos, Michigan high school title games, MAC Championship, Motor City Bowl/Little Caesars Bowl and more, there has been a lot of wear and tear on the field and the markings. A year or two ago, when they have the Michigan high school football title games just after the Thanksgiving game, they have to pull up the Lions logos, and midfield didn’t clean up well because of all the times it has been removed and there was just a huge blue spot in the field. It also explains the massive amounts of tire coming up in pictures and video. I would mock you for the misquote, but it’s from a fan translation so you’re still technically right. Re: F1/Nico Rosberg… Most F1 drivers have sponsorship deals with different watch brands, and the top 3 finishers at each race would put on their watches on the podium. But now that Rolex is the official timing partner of F1, that practice is no longer allowed. This sounds familiar, don’t it? The Bud Light ad with Rams fans wearing the old school jerseys is time-period appropriate, not a sign of uni conspiracy. In the spot, it is late in Super Bowl XXXIV, and they’re hoping for a big stop on the goal line as the game ended. Ooh, is that so? I didn’t pick up on that. Good call. I didn’t pay attention to the other teams’ segments, are they also “period pieces”? I caught a little bit of the commercial, but they all seemed to be watching past Super Bowls (Steelers guys were definitely watching XLIII). Yeah, they were all watching famous SB endings. Rams over Titans in ’00, Steelers over Cards in ’09 and Giants over Pats in ’08. I also noticed they removed all the maker’s marks from the fans’ jerseys, obviously since they’re not Nike. Sure enough, the Bud Light labels are the old design. Why is the Rams end zone logo so plain and generic? Might as well say “Football Team”. Have they stopped caring in St. Louis? So now the site mods just openly mock an entire fanbase that includes fans of this site . . .
Was there a college game there on Saturday? I know that when the Illinois/Mizzou game was there, they had to change the endzone quickly. As a Rams fan, one that attends every game, we love it. Previously we had a much more drab look, with the simple Rams wordmark on green turf. For the season finale last year they wanted to try something new to acknowledge the fan base. So they painted the end zone blue and simply put in St Louis. We love it, particularly in the context of the team remaining in the city. As I was fast-forwarding past some commercials while watching TV, I saw someone in one ad wearing a blue Earl Cambpell Houston Oilers jersey. When I rewound to check it out, it turned out to be a McDonald’s commercial in which two guys are extolling the virtues of the latest McDonald’s promotion by comparing it to football events, as they drive to the restaurant. (And the punch line is that the woman in the drive-through joins in.) One of the guys in the car is wearing the jersey. Nothing new about the team-colored tortilla chips in the Los Angeles area. Los Angeles-area have been selling USC and UCLA colored tortilla chips for years. They always pop up during football season, and are more visible during the weeks leading up to the rivalry game. They’ve been in the Cleveland area for awhile now as well. Anyone else think JT Marvelous was a contributor at first? That would be a great fake name, stage name, wrestling name, etc. Yes, yes I did. And agreed. If you think that is good, their other team is JT Thunders. Paul, you have achieved a rare level of relationship nirvana/maturity where you are capable of not only going to your current lady friend’s ex boyfriend’s art show BUT then proceed to use your (somewhat) large online audience as a forum to heap praise upon him and give him free publicity. Talented or not, I don’t know if my pride would allow me to do both of those things. I’m not insecure or immature but I guess my caveman territorial instincts prohibit me from swooning over a dude who used to drill my current girlfriend, especially using my own website as the medium. Unless you Brooklynite 40 something hipster types are into that type of “free thinking”, or she’s just a casual hookup so you’re not emotional vested which makes it a little more understandable. 1) They dated something like 10 years ago, which is pretty ancient history in relationship terms. 2) I’m not “swooning over” Mark. I met him briefly at the gallery reception but otherwise have very little sense of him as a person. I’m just swooning over his work, which I greatly admire. For all I know he’s a total jerk (as has been the case with several other people whose work I’ve greatly admired). Or he’s a great guy (ditto). Either way, that wouldn’t really change my opinion of his work. 3) The New Girl and I are both friendly with several of our exes, and have become friendly with some of each other’s exes. We’ve both been around the block, and we realize that past experiences are part of what make us who we are. Neither of us is under the illusion that the other one was a virgin when we met (nor would we wish for that to be the case). I don’t know that this makes us “mature”; I think it’s just accepting reality. 4) I would never describe anyone as “drill[ing]” anyone else. Ewww. well played all around, as we age we all leave a trail of exes a mile long, if we stay single that is. acceptance is key therefore! Is it possible that the sleeve stripes are intentionally mismatched on the Winnipeg jerseys? I don’t have any photo evidence laying around, but it wasn’t exactly uncommon for players to wear mismatched items on the field during that era, even in the NFL (let alone the CFL). I noticed the mismatched jerseys before the game started. I’m sure it’s just another f*** up in a long series of them for our beloved (sorry, Paul) Blue Bombers. Not nearly as intricate as Wagner’s, but I came across similar “money mosaics” by Ecent Design at an art show a couple summers ago. Thought this was particularly poignant. I don’t understand the Arkansas State penalty for insufficient contrast. Either it is insufficient contrast enough to play, in which they should either be forced to change or forfeit the game, or it is of sufficient contrast that they can play (without the quarterbacks throwing to the wrong colored jersey by mistake). But to say it’s insufficient contrast, penalize them 15 yards and then let them play anyway makes it sound like it’s simply a RFRS – “rule for rules sake”. Obviously you can tell the difference between their grey and Auburn’s blue, enough to play a game. Same thing for UCLA vs USC going red vs blue. If the visiting team showed up wearing the same shade of blue as the home team, would they just give them a 15 yard penalty and still let them play? I doubt it. The home team might have to begrudingly change into white if the visitors didn’t bring white unis (why would they?) but I doubt they would let them play. The rule requires that the opposing team approve, my guess is Auburn okay’d the look for play, while the refs said not a significant enough contrast and thus the penalties to start each half. Similar to how under the old rules USC approved UCLA’s look, but the rules said one of the teams had to wear white, and thus UCLA was penalized. Sorry, it’s a secret ballot. But as I said in the Ticker, it won’t be Christine Quinn. That’s a pretty coy way of saying you’re voting for Jimmy McMillan. He’s clearly voting Weiner. Think about it: Paul is all about meat, especially sausage, so the only way he doesn’t vote for a guy named Weiner is if there’s another candidate named Bratwurst or Marrow in the race. In all seriousness, I don’t have an issue with station naming. I just wish they got more than $200,000 a year (for 20 years!) from Barclays. And it’s fine if there’s a clear link between the name and the station/locale, like Barclays, but otherwise, it would have to be something like “Google 14th St/8th Ave Station”. Also, shouldn’t the MTA be charging the New York Times for the Times Square/42nd naming rights? A lot going on in this photo from the 1942 NFL championship between DC and Chicago – including an interesting yard marker and a dude in a bear suit. Inconsistent stripe widths aside, Packers-49ers has got to be an early contender for best-looking game of the season. It’s almost not fair to the rest of the league. You have a really funny way of spelling Raiders-Colts. Yes on Colts/Raiders, but Packers-Niners? Burn the heretic! Packers/Niners is good either way. I just prefer hunter green to red. But both combos look great. Looks like the Packers’ pants are back to a more “goldenrod” shade of yellow, which is good, too much “lemon” last year (Rams too, in their throwbacks last year), now if Nike could just get the metallic look back in the 49ers’ pants (and the Saints, FSU, and all the others), we’d be good to go. I don’t think we have enough evidence to suggest a change – the colors vary too much under the different lighting conditions. During last night’s game, every time there was a caption of Tony Romo, he was either wearing a blue cap with an NFL logo (looked photo-shopped) or a white cap with a blank blue front part (again, it looked like the front logo was photo-shopped off). It was very odd to see. I know that in the past he would wear a cap with the Starter logo so now wondering if now that the NFL is aligned with New Era the NFL made NBC remove the ‘Starter’ logo. It didn’t look Photoshopped to me but the Shield Logo was Humungous, like larger than you would expect any hat to have. It was definitely a blue hat. Can we add that to the list of zero-tolerance adjectives? Not that there’s anything wrong with that, (Seinfeld reference intended), but Myers’ man-crush was way over the top. Wouldn’t it make more sense to make a Lincoln portrait out of 5 dollar bills since, you know, Lincoln is on the 5? He only uses $1 bills, period. Why not just “Washington”, as in “Washington played the Rams”? Always thought the best solution to the Washington naming issue ,would be for the team to be renamed either Americans or Sentinals and retain all the current Colours and logos ,they could even keep the helmet logo or change the head silloette to a “W” this way everyone wins, a non offensive name but paying tribute to Native American Culture and team history!! There was an article several months ago floating the idea of naming them “Warriors” as in “Wounded Warriors” and honoring the military. Would he have to charge 5 times more for his art?? The Supersition add with the Rams shows “The Tackle,” which was the last year that they wore that uniform. It tells nothing about what the Rams will eventually wear. Just being historically correct with the colors and uniform at the time. Kinda surprised that there wasn’t a Warner jersey spotted though. I’m starting to get annoyed by the Skins watch. If you don’t like the name, so what? I come to this site for what teams look like, new uniforms, and the history aspect. For the people who are annoyed by names, whatever they maybe, get over it tightwads. Enjoy the uniforms (because all of those teams look good for the most part) and stop bitchin about what you may think is wrong, unless it’s something like side panels, reboxes, or the Marlins and Loria’s carnival in centerfield. It’s too bad the ‘Skins Watch isn’t clearly marked so the easily annoyed readers can’t easily skip over it. But if you don’t like the section, so what? Paul edits this site however he chooses. For the people who are annoyed by the ‘Skins Watch, get over it tightwads. Enjoy the site and stop bit chin about what you may think is wrong. Possibly the most creative use of “tightwads” ever. I can think of another word with “wad” in it. While “beloved” may be reaching overuse in our culture currently, the fast food equivalent would be pretzel rolls. Seems like almost everyone is trotting out a sandwich with that as the bun. Yes, but they’re not as beloved as regular buns. When watching the Wisconsin game Saturday I noticed not only the TV numbers on the shoulder have been moved to the top of the shoulder but the NOB is in a different font. Has this changed on other Adidas college uni’s? Is this Kansas basketball uniform new? Apparently, sautÃ©ed chard is “beloved”. To be fair Melissa Clark specifies in the article that it’s beloved by her, but still. This brings it all full circle, since Clark herself was recently described as “beloved” in an article, and that’s what put all o this on my radar to begin with…. COTD–pic #4. What is being surveiled so? I am bummed that I didn’t know this exhibit was ongoing as I was in NYC last week. I was stomping around Chelsea for a bit, too…..
How did you end up resolving your parking situation, Jen? One of the sites that you or terrible human gave to me. One of the garages was right under our hotel (Bentley at York and 62nd). The hotel would have charged us $200+ and we used the coupon and paid about $120 for the week, so that bought a couple meals. Can we talk about the Jaguars for a minute? As much as they’ve been panned – and rightly so – they really don’t look that bad from this angle. Granted, you only see a black helmet, the pant stripes appear solid black, and you don’t see the funky numbers, but it could grow on me… maybe. That’s just about the best possible angle for the helmet–you can see the logo, but really can’t tell too much that there’s gold on the back half. I wonder if someone with greater Photoshop/art skills than myself would be able to render the helmet with the same fade from gold to black, but more gradually. I suspect it wouldn’t look nearly as bad. Likewise, an all-gold helmet would look pretty snazzy, though I imagine the cat’s head would be slightly more difficult to distinguish. I just want to register my complaint about the “pop behind” ads on the Uni-Watch site. I know that you need to make money off the site, and I want you to be able to profit off this website, but an ad that pops up behind my browser and starts talking is UNACCEPTABLE. Once it starts, I have to then move my current window, and then turn the ad off. At least with a pop-up ad that appears on top of the browser window I can easily close it. Please think about removing the pop behind ad – I really can’t stand it, and it makes coming to Uni-Watch less enjoyable. That shouldn’t be happening, and I fully understand and support your annoyance. Can you tell me what the ad was for? I’ll try to get it taken care of. Chris – you should look into tightening your security as to pop-up ads, ads that automatically run, etc. I’m on the latest version of Chrome and with my settings, I see no pop under/up ads whatsoever. Chargers wearing mono-white at home. Ugh. I concur, sharp look. Much better than the navy pants with navy socks. Yeah, but it’s a home game, at night. They should be wearing blue jerseys. Late to the board, today, but I’m surprised no one’s followed up Paul’s comment about the Wisconsin helmet. Admittedly, I never was a fan of the Flying W, but on that red helmet, it really popped. The white face mask looked good, too. This look was made for the Badgers. As a Badgers fan I didn’t know what to think at first. Orignaily they were going to go with all out red. I was at the game and heard mostly positive comments about them, the negative was they look like Indiana. But then again WI and Nebraska look alike espcially with both teams being Addias and now the Badgers are going with white cleats. I would like to see them wear them again when they are one the road with the red pants. I would also like to see them with a Bucky Badger logo on the helmet in the future though. I think the Flying W needs an update but still better than most logos out there. I liked the Chargers in all white. Frankly, with so little dark blue on the white helmets I don’t think the dark blue works as well as the powder blue does. The term Redskins just isn’t a slur anymore. Its not nearly on par with the n word particularly because of the path both words have been down. The n word has had consistent wide spread use as the epithet it is even up until today. No one uses the term redskin to disparage natives anymore, and they haven’t for a long time. One could argue that having a team using that name as a positive may have had some effect on that. The only people who use Redskin in a negative way are the ones who actually seek to censor the word altogether – you are giving it its negative power back. I’m sorry but that’s counterproductive to the announced purpose. I have a feeling the actual purpose is different. The name should never be changed, it should be able to stand as a representation of the positive it is in most modern contexts – a team that millions of people love and support. Hopefully the “progressive” need to control the world around them will fail. Thanks for this helmet’s stickers. It is nice. Tagsports is the best one sports stickers and decals provider. It is best stickers and Decal provide.